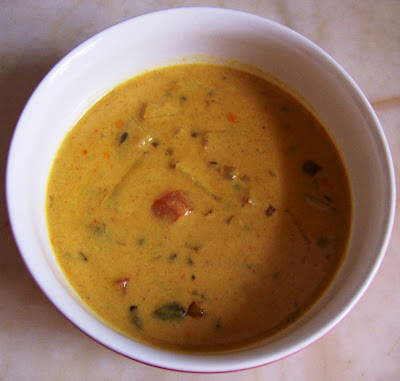 This is a spin on the classic Kadhi Pakoda. I am not a fan of fried stuff floating in liquid - whether it is dahi wadas or vadai curry, but I do love yoghurt based dishes. So, it was a matter of time before I appropriated this dish and made it my own. I love the flavours the vegetables bring to the plain yoghurt and the best part of it is of course the tempering ingredients. They lend an unmistakable touch to the dish and I think there must be some culinary link based on either Ayurvedic or similar principles between the yoghurt based dishes made in different parts of India. Otherwise, how does one explain the dhania and methi seeds ground into the Mor Kozhambu of the South appearing in the tempering of the Punjabi Kadhi and Gujarati kadhi (only the methi there though), the mustard and hing in the tempering of these dishes and of course the thickening of the yoghurt with gram flour (besan) in kadhi and the chana dal(bengal gram dal) ground into mor kozhambu. But coming back to topic - there is a reason yoghurt based dishes are found in almost all regional cuisines of India. Curd or yoghurt is traditionally known to have cooling properties - a much prized quality during the heat of an Indian summer. But besides this there is a nutritionally sound reason for including curd in our day-to-day diet. The lactose (natural sugar) found in milk when allowed to ferment into curd, changes to lactic acid - a factor which enhances the absorption of calcium by the body. Tempering (tadka/baghar/thalimpu/poppu) is an intrinsic part of Indian cooking and imparts a distinctive flavour to any dish. Do you know its other benefits? The hing (asafoetida/perungayam) used to temper dals makes it easier to digest protein heavy pulses and avoid flatulence. Certain vitamins are only soluble in fat and require a medium for release - e.g vitamin A found in carrots and the carotene in curry leaves(karuvupellai/karipatta). Essential fatty acids required by the body are found in the vegetable oils used for tempering as also in mustard and urad dal. So, the next time someone at home complains about the tadka smell remind them of the good it does (the tadka, not the smell!). 1. Mix the water with the curd and whisk till smooth. Take a little of the mixture and mix in the gram flour so that there are no lumps. Combine this with the rest of the diluted yoghurt along with salt and tumeric. 2. Take a large pan and add the yoghurt mixture and heat on a low flame. 4. Add the chopped vegetables to the tempering and saute for 2 minutes, then cook on a low flame for another 5 minutes till almost cooked. 5. Transfer the tempered vegetables to the simmering yoghurt mixture and continue cooking on a low flame for another 10 minutes till it thickens and the besan is completely cooked. 6. Serve with chapatis or rice. Miri - Your recipe is awesome. I like how it's simple and seems pretty fast to make. And healthy as well! I will be making this one soon. Thanks for sharing! Thanks Asha,Kalai,Nina and Alpa - you will love the chunky tadka bits! But I prefer it with the pakodas. I made this recently... added palak instead :-) what a coincidence :-) And when are you meeting me? this is a lovely kadhi in such a nice color too. I hope you re participating my Tried And Tasted event. Zlamushka - I am on holiday now, will get back and take a look at your event! Thanks! Miri, it is such a clever idea to add vegetables rather than pakodas. I have got to try this! 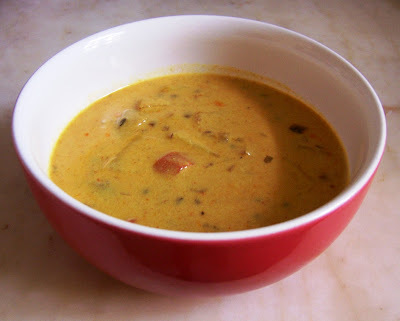 Hi Miri- Thank you for this mixed vegetable kadhi. I finally tried it this week and it makes for a fantastic winter dinner. Love the succulent veggies in the kadhi.